#eKidzWorship album UNDEFEATED available today! 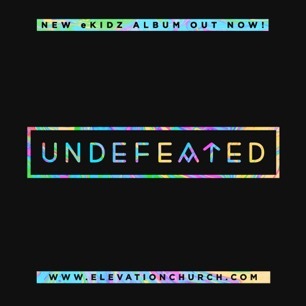 Today our eKidz ministry, in collaboration with Elevation Worship, releases its first original album, Undefeated. The album features seven original songs we hope will resonate with families worldwide. In creating these songs, we wanted to meld simple uplifting lyrics with the sound and quality of radio-mastered hits. Most importantly, we wanted to encourage kids to freely worship our Savior, Jesus Christ, in a fun and exciting way. We hope you enjoy the album. For lyrics and worship videos head to eKidzWorship.com. To download the album now, click here.